Yesterday I forgot to tell my language arts classes that their brainstorming page was homework. I had said, “Finish it before you write your draft. We will work on the writing in class tomorrow.” I had planned on an easy-for-them daily grade for doing the work and showing me in class. I received an email about this assignment because it wasn’t on my school’s website. I had emailed it as an attachment to the parents. It was not written in the agenda as homework. I was not trying to be confusing or difficult. I felt even more micro-managed than I already have been. “Have them write ‘HW’ on homework or ‘classwork’ on in-class work. Have him take a picture of the agenda with his phone at the beginning of class. Receive an email at 9:12 A.M. during a class. Receive another at 9:30 A.M. chiding your slow response to the first email. Receive another email at 9:43 asking if you’ve seen the previous emails. Class ends at 9:53 A. M. Another one begins. Still no response to email. Call the assistant principal about the teacher not responding to emails in a timely manner. When I click the mailbox icon to check my email, I see several from one parent in my inbox, an all-staff email about a school-wide directive, an invitation to an ARD or Section 504 committee meeting, a notice about some paperwork for a student who’s taking meds, fourteen hundred pieces of junk email, a reminder about that meeting that starts in three minutes, and a reminder about a staff meeting after school this week. This is a slow day. Take data for Special Education students accommodations. Each six weeks. Record how they are progressing in your class. Reading goals. Writing goals. Behavioral goals. Keep up with Section 504 students’ accommodations. All of them on a daily basis. This means reminders to be on task. Preferential seating. Learning lab privileges. Copies of teacher notes. The copier is jammed, or the person who copies entire dictionaries is just starting her print job, and the notes need to go home with Janey Sue before her dental appointment this afternoon. Mom will email you if you don’t get them to Janey Sue before she leaves for the day. You had her first period, and she is not in your hallway again until fifth period. It is now fourth period. You’re late for the meeting trying to find an open and working copier. Manage aberrant behavior in classrooms with strong-willed personalities determined to break your resolve. Calmly. All of the time. Come up with an enrichment or remediation lesson for students who need it. For both subjects. And decide which one deserves priority this week. Oops. You chose incorrectly again. Monitor students in the classroom and hallway at the same time. While standing in the hallway/doorway, field questions asked over the music in the hallways about what is needed for class while holding a sign that lists the needed items. I have held up a sign that read, “Bring colored pencils.” To me it is obvious that if a student does not have them, then they would not bring them. I will have several stop goggle-eyed and say, “Do we need colored pencils?” Others will state, “I don’t have any” and stand almost dumbstruck. I make them go inside the room by saying that I have colored pencils. By the way, I have had colored pencils in my room since day one. They don’t remember that. They haven’t any problems telling me what they don’t have or if something is “unfair.” Oh, and make sure you unstick the locker of those students whose backpacks, jackets, etc. clog the mechanism. The veins in my arms and forehead bulge out as I strain to pop them open. Oops, those recalcitrant kids are off-task again in my room. I had to contact parents of students whose grades were not up to the passing standard. No one wrote back to question the grade. I was surprised. Several of the parents heard from me twice since I teach both social studies and language arts this year. Now they know, and now we move forward. I gave them my tutorial schedule and several reasons why the grade was low. I placed the responsibility on the student. We shall see how my serving notice goes over in the future days. Yesterday, one of my angry young men spoke out disrespectfully in front of his classmates after redirection to work. He still made no effort. I sent him to the in-school suspension room. As he left the classroom, I spoke up, too, “That was disrespectful and unacceptable.” The other students watched silently, and class resumed its easy demeanor. Our team has a goal to make positive contact with about ninety percent of our parents. We are doing this with phone calls and emails. I took a risk and wrote an email to Papi’s mom today. This is the text of the email. Hi, I know we have spoken on the phone and communicated via email about me keeping him for extra time after school on a couple of occasions. I am writing because I wanted you to know that I enjoy having Papi this year. I don’t know if he has said anything about me to you, but my family knows about him. He is a unique young man, and I have threatened to adopt him. My husband has vetoed me on that score. Papi was in my arboretum field trip group this past November and acted as a junior chaperone. It was actually quite sweet although you may not want to tell him that. He helped me keep track of the kids in our group and kept me laughing even when I did not let him see me laughing. I love that young man and look forward to seeing him every day. I wanted to let you know. Have a good evening. The mom who wrote about my “unreasonable deadline” was understanding and appreciated my clarification when I explained the extra time and attention I took for the group of students who missed out to being in school due to an extracurricular activity. The student had completed the work, so things looked good in my grade book. Check off one parent who may not have agreed with me, but we worked it out. Now I am scratching my head after a different parent wrote me this evening because his student does not have the work to complete the writing assignment. It is not in her possession. I cannot say if it is lost at home or in her locker. She does not have what she needs to do the work. I sent it electronically (during my protected family time!) after dad asked for a suggestion on what to do. I also carbon-copied my administrator just to keep her in the loop in the event that backlash rears its head. This is the same child who felt I hurt her feelings five weeks ago. At times I feel that no good deed goes unpunished. I am simply waiting for the other shoe to drop. Just waiting. Tick-tock. Tick-tock. Tick-tock. I gave some students who would miss school for a school-sponsored activity an assignment ahead of the rest of my students. 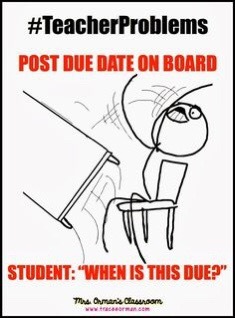 Their due date is the same as the other “left behind” students; however, they had an extra night. Why was I challenged about the due date when I gave them extra time and pulled them during our homeroom time late last week to explain everything to them? Okay. This was unexpected. I do have to move forward with my lesson plans. I will be grading a number of papers over the next few days or so. I was caught off guard and wanted to fire back with a pointed question and observation of my own. I did not. A response will not be written until tomorrow within the twenty-four hour limit I am permitted. I maintain a Facebook account and read posts that my friends allow on their timelines or links that appeal to me. I read a post that a parent wrote about her child getting into trouble at school. When the teacher called home, the teacher received full parental support and an encouraging email the next day. When I have to make that unpleasant phone call about a student’s behavior choice, it is sad to say that I expect to be blasted, called a liar or worse, and ridiculed. Too often, a student goes home and tells the half of the story that makes him look good. When the teacher calls to tell the full story, she isn’t always believed. This spoke to my heart because of a situation that happened before my recent holiday. A student was corrected for being disrespectful. When I turned my back to walk away and return the discipline log to its place, he threw a pencil at me. It hit the wall. He was asked to leave my classroom for the rest of the period. I called his parents and expected a response. He came in the next day with the same surly attitude. No email or voice mail came from either of his parents. I was at a loss for words. He has never apologized to me, and I suspect that he probably won’t unless his parents encourage repentance in actions and words. My trust has been broken because I have never encountered what felt like a physical attack on my person before in my career. Some cowards have probably shredded my reputation on those teacher rating websites I won’t deign to visit. I can’t win them all over. I can be respectful and professional. I can correct abhorrent behavior appropriately. As a parent, I know my son, and I know that he is not a perfect person. He will make mistakes. I want to hear what he has to say for himself and see that he repents. I want the teacher to give him another chance to redeem himself. I appreciate it when that happens. He has to earn back the good graces and favor one step at a time. 1. I owe you, my student, a good grade even when you don’t turn in your work on time. Or even turn it in at all. I owe you the right to gossip on your electronic device in class whenever you feel it is appropriate. Oh, yeah, it’s also okay to talk during class because what I am saying or teaching isn’t important in the real world and certainly doesn’t apply to you. 2. I owe you perfect attendance when you arrive tardy to class or don’t bother to show up the day before a school holiday. How could I possibly have scheduled a test or quiz on that day? What was I thinking? Isn’t it party time? 3. I owe you my undivided attention on weekends and after hours on electronic communications because your parents practice bullying via email. 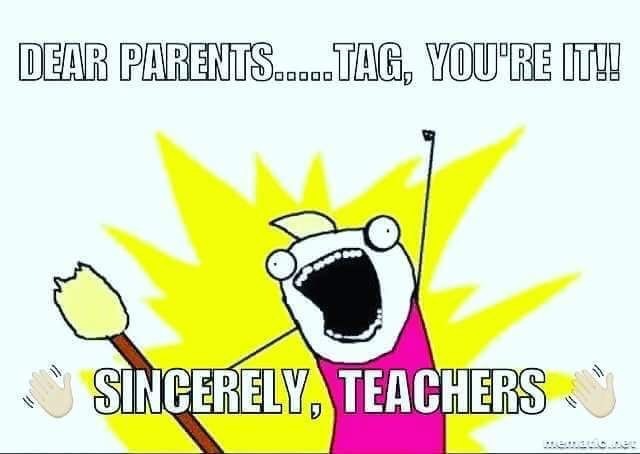 I owe you sleepless nights before hostile parent conferences in which your parents believe I will lie to them about you and your actions or inaction. I also owe you the migraine episodes that are stress-related because you won’t accept any responsibility for your actions. I think I’ll even take the state-mandated tests for you and save you the trouble. 4. I owe you my kidney stones because I cannot trust you to simply behave yourselves in the hallways as the classes change; I cannot go to the bathroom in peace because my eyes must constantly be focused on you. I owe you copies of my notes, preferential seating (all fourteen of you in one class! ), and extra time on assignments. 5. I owe you my out-of-this-world copy quota because you can’t be bothered to keep up with the first three copies I gave you. If I don’t give you that copy with three words filled in on the notes, then I hear about it. LOUDLY. 6. I owe you my bad back and dwindling supplies because you can’t pick up after yourself or bring your own pencils, or notebook paper, or reading material, or homework, or good manners. I have had to pick up used tissues, scrape gum, and toss trash because it was an imposition on your precious time. 7. I owe you all of these things? Hmm. . . I also owe you my bad reputation as “the mean teacher” because I ask you to behave like ladies and gentlemen, and you despise correction of any sort. I guess I will owe some of you three squares and an orange jumpsuit because listening to me tell you right from wrong is nonsense. Why should telling a member of the law enforcement the truth be any different? It’s just too much effort to do the right thing the first time and to be honest when you’ve erred. I don’t owe you these things. I do what I love and usually love what I do. It is individuals who make poor choices and wreak havoc on the populace who cause the greatest problems. Their narcissistic focus on the short-term eventually catches up with them. I, however, don’t want to see the rotten fruits of their labors. Ciao.